Bangalore being one of the busiest cities in India has a population which is always on the run and one of the most advanced in terms of lifestyle and technology. But the city also has a population which is deprived of the basic needs. They work as daily wage labourers and can hardly avail any facilities and due to such situations availing healthcare has always been a major issue among the population. Women and children are the most affected groups in such areas. 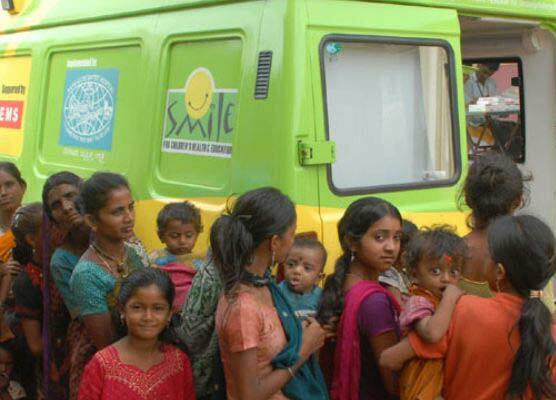 Smile Foundation partnered with BAE Systems to initiate a Smile on Wheels project in the northern and eastern part of rural Bangalore. Launched in January 2014 it reaches to 25 operational locations including villages and urban slums across Bengaluru. Forced to be engaged in household activities and suffering from the oppression of gender based caste system women hardly move out of the house, let alone avail healthcare services. The project aims to sensitize the population mainly the male population about the adverse effect of their actions on the health of the women and their children. After the start of the project relatively more women have come forward to avail health care services. The tireless efforts of the Smile on Wheels team have continued to avail good results ever since its initiation. A range of preventive, curative and promotive services are offered as a part of planned interventions under this project. Curative services include OPDs while preventive and promotive entail Health Awareness Programmes. OPDs are conducted on a frequent basis where the turnout of women has been recorded to be 54%, which is higher than males, 44%. Maternal Health Care and Reproductive Health Care is also covered under the health camps and special attention is given to pregnant women and women and children below the age of 5. Pathological services are also provided regularly like various kinds of lab tests like GBRS, Blood Count and Urine Tests etc.